✩ B4 Bright Sparks ✩: Monsters! Are you scared of monsters? Well, don't come into B4! We have been writing about our own made up monsters and some of them are pretty scary. We tried to make our descriptions sound interesting by using a question or a super sentence at the beginning of our writing. We have also been learning to use different sentence starters by changing around some of our sentences. Instead of writing "She has 10 red shiny eyes on her enormous head", we could say "On her enormous head she has 10 red shiny eyes." Here are some of our descriptions and artwork. Come into B4 and read some more. Don't worry, not all of the monsters are scary - lots of them are are friendly too and some even tell jokes! Great descriptions guys. The monster pictures are exciting too. We have written descriptions of Taniwhas and tried to make our writing exciting just like you. Tootle Pip! Well Bright Sparks, you are definitely that! 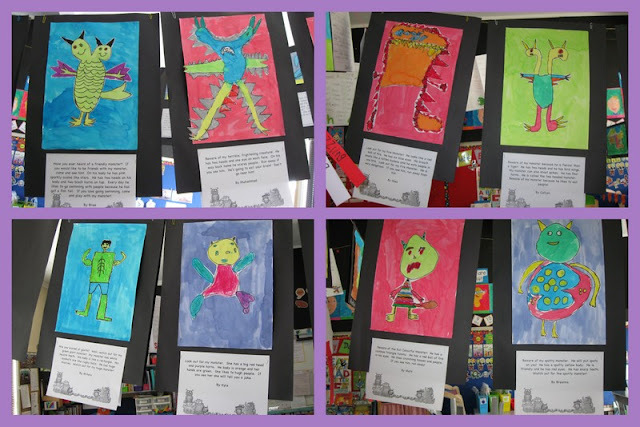 You are very clever writers and have written such vivid descriptions of your monsters, that even if I couldn't see your fabulous artwork, I would have a very clear picture of them in my mind! Thank you too for the warning, that they really aren't that scary so I will pop in again soon to visit you!